There's a Study! | Wott's Up With That? Category Archives: There's a Study! “97% of pictures are worth 1000 climate words“ (2014-02-27). Anthony Watts posts a profound intellectual insight from his favourite denialist blow-hard, Lord Monckton. Shockingly, it seems that not every single climate paper is about the cause of the current rapid global temperature rise! Many of them don’t even mention the issue! Therefore no Global Warming. In other equally profound news, the cause of Global Warming is never mentioned in surgical journals, more excellent proof that there is no Global Warming. But wait, Monckton’s claim is that “Only 64 of 11,944 published since 1991 said most warming since 1950 was manmade: i.e. 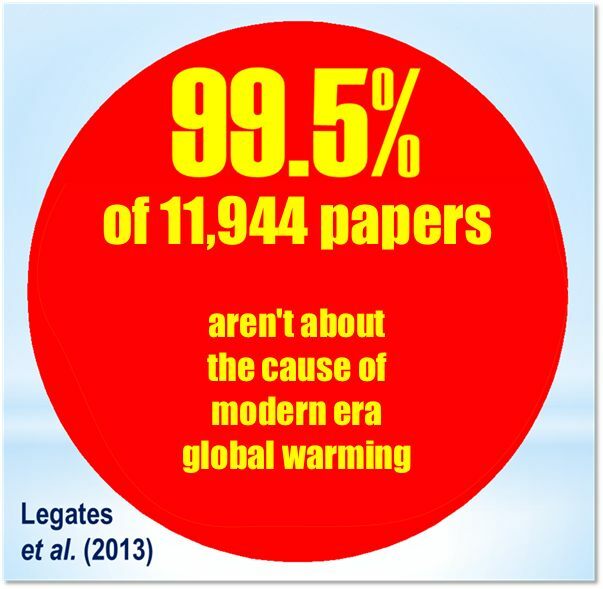 0.5%” This means that 11,880 papers asserted that the warming has been natural! I’m looking forward to reading some of them. Sadly for the loony Lord, no. The other climate papers about other subjects entirely. Fixed it for ya, Monckton. But don’t be so modest, you’re fourth author on that Science & Education paper! Authors Steirou and Koutsoyiannis, after taking homogenization errors into account find global warming over the past century was only about one-half [0.42°C] of that claimed by the IPCC [0.7-0.8°C]. Strange how Anthony forgets that even denialist Roy Spencer’s satellite temperature records show a 0.46°C rise in 33 years. One might think a bit of caution is in order when someone claims that only there’s been 0.42°C of warming over the last century. A student can make an error and conferences are there to talk about preliminary results, much more worrying is that Anthony Watts keeps on getting his facts wrong. An EGU abstract is simply not a peer reviewed paper. Of the three sentences Watts cited from the “peer reviewed paper”, two can only be found in the slides of the talk, which are not reviewed. Every post on Watts up with that?that is on a topic I am knowledgeable about, contains serious factual errors and clear misrepresentations. I am not talking about having another opinion, but facts. If clear facts are already wrong, I start doubting the rest. One wonders why the readers of Watts up with that? keep on reading that stuff. There seems to be little interest in the truth among these self-proclaimed skeptics. “BREAKING NEWS – CERN Experiment Confirms Cosmic Rays Influence Cloud Seeds” (2011-08-24). Anthony Watts tells the world that a cosmic ray experiment at CERN (“CLOUD“) proves that global warming is all because of cosmic rays! Thus ending global warming once and for all. The AGW theory is “dented”! Anthony’s analysis consists pasting in a biased interpretation by the Global Warming Policy Foundation’s elderly denialist, and Henrik Svensmark pal, Nigel Calder. Henrik Svensmark is the widely discounted proponent of galactic cosmic rays as the source of all climate change. Hmmm… Could it be true that “CERN Experiment Confirms Cosmic Rays Influence Climate Change”? Well, maybe cosmic rays contribute to ionization, but the experiment being hailed by denialists only detected events at scales too small to trigger droplet formation. Sadly, historical climate change patterns also show no correlation at all with cosmic rays. So… maybe not. Want to read something intelligent on the matter? Try Real Climate’s post “The CERN/CLOUD results are surprisingly interesting…” There’s certainly more to learn from this experiment. “Pielke Sr. on new Spencer and Braswell paper” (2011/07/26). Who’d ‘a thunk that Roger Pielke (the dad who’s a grumpy scientist, not the son who’s just a grumpy economist) would, again, sing the praises of Dr. Roy Spencer’s latest paper proving, again, sort of, that there is no global warming? Anthony Watts is excited enough by this startling development to copy and paste Pielke Sr.’s insights. Dr. Pielke Sr. intones that Dr. Spencer’s paper, On the Misdiagnosis of Surface Temperature Feedbacks from Variations in Earth’s Radiant Energy Balance in Remote Sensing, “raises further questions on the robustness of multi-decadal global climate predictions”. Yes, it’s the final nail in the coffin of global warming alarmism! Again! This time, for real! Oh, they have to be smart questions? Oops. Remote Sensing, for their part, is a new journal that seems more interested in publication fees than ensuring the scientific credibility of their papers. Not yet referenced by Anthony, there’s also an enthusiastic “so there!” article in Forbes magazine. Right-wing climate change denying Heartland Institute lobbyist James Taylor sings the praises of right-wing climate change denying scientist Dr. Spencer, also tightly associated with Heartland Institute, in a right-wing climate change denying magazine! It stirs the soul to see all the pistons firing together so smoothly but using “alarmist” in 15 times, in practically every sentence, shines the spotlight in a presumably unintended direction. So, what about Dr. Spencer’s science? Do clouds really cause climate like Spencer keeps saying? Is the Earth really failing to warm up quite as much as alarmist scientists say it is? This is just a laugh-at-Anthony-Watts’-lies blog, so today I’ll simply point out some of the criticisms from around the web. Synchronized shouting seems the only tactic left to the denialists. 2011-08-01 Update: Climate Progress weighs in on Spencer’s science that Pielke Sr. likes so much. Climate Scientists Debunk Latest Bunk by Denier Roy Spencer. 2011-08-10 Update: John Timmer covers Spencer’s paper in the larger context at Ars Technica – Climate change: cloudy, with a chance of competing realities. 2011-09-02 Update: More embarrassing fallout for Spencer covered at Ars Technica – Editor who published controversial climate paper resigns, blasts media. 2011-09-07 Update: Well this hasn’t taken long. Spencer’s ‘final nail in the coffin of AGW’ has completely unravelled. Turns out his crayon version of atmospheric physics has in fact proven the validity of current “alarmist” climate theories and models! Thanks Roy. That’s what happens when you work backwards from a baseless conclusion and ignore logic. Thanks for wading through the stupid, Dr. Dessler (preprint here, watch a video summary here). “A helpful note to Dr. Eric Steig“. Anthony Watts casts about for something critical to say about “perfesser” Eric Steig, whose 2009 paper on Antarctic warming trends was supposedly refuted by Anthony’s team-mates, O’Donnell, Lewis, and McIntyre. In this case “refuted” means that they packaged the data slightly differently and got slightly different warming trends. Thus revealing once and for all (the denialists shouted) that Global Warming isn’t happening. And why did WUWT show an image that appears to have less warming than the one shown here by Eric? Sorry but I have to fault you both there..the figures should show for what season they are valid, or if they are for annual temperatures. So what is Anthony’s “gotcha” advice to Dr. Steig? It wasn’t Anthony who used temperature color bands that visually minimized warming in the Antarctic temperature anomaly map shown on Watts Up With That, it was someone else! Ooh, snap! Anthony just blindly copied and pasted it, like the alert “skeptic” he is, so you can’t blame him for any graphics shenanigans. Take that “perfesser”, you were impugning the wrong website! In my opinion, the Steig reconstruction was quite clever, and the general concept was sound. Poor Anthony’s looking for a way to pretend the denialist firecracker didn’t fizzle. Dessler concludes that cloud climate feedbacks are positive, and generally agree with what Spencer incorrectly calls “the IPCC computerized climate models.” (The IPCC only consolidates climate research, it has never performed it. Spencer knows this.) Spencer says that clouds stabilize the climate and prevent climate change from occurring (i.e. a negative feedback) and claims that in particular cloud formation triggers the Pacific Ocean’s El Niño circulation pattern. Unfortunately Spencer’s theory is pure wish-fulfillment, he has neither a theoretical mechanism for the proposed process nor evidence of its occurrence. Dessler’s theory, which predicts that the El Niño circulation pattern instead drives cloud formation, has both. This blog isn’t the place for detailed scientific discussion, so I suggest readers follow the conversation at Real Climate, and perhaps follow Dr. Dessler’s comments in the Watts Up With That post. Tip for Dr. Spencer, Ph. D.: Avoid muttering about conspiracies and censorship if you hope to be taken seriously, and stay away from meaningless analogies about x-rays vs. MRI’s to “prove” that your superior methodology unless your purpose is simply to distract your readers.